SANIMED products have been developed and are produced by Vobra Special Petfoods B.V., Veghel, The Netherlands. The company produces and distributes pet food only and has since 1932 experience in the field of animal nutrition.. Quality is one of Vobra’s highest priorities. Vobra is ISO 9001:2008 and GMP+ B8 certified. This is to ensure that the food that we supply meets all quality requirements imposed by European legislation and meets the additional requirements of GMP and ISO 9001:2008. 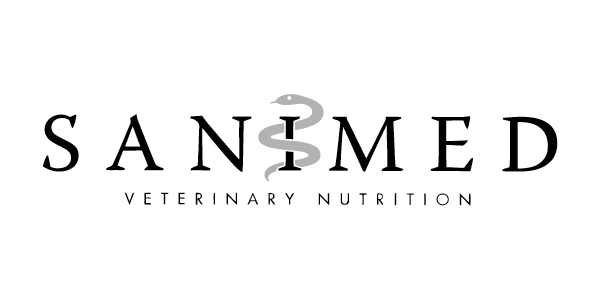 You can be sure that any food for your beloved pet is developed, produced, packaged and delivered in a safe manner. SANIMED contains only top-quality, natural ingredients. The raw materials that get supplied to Vobra are monitored and analysed by the quality department. Raw materials are inspected microbiologically and chemically, for odour, colour and composition, to ensure that the raw materials meet Vobra’s high demands. Added to that, Vobra only works together with qualified suppliers. These suppliers are reviewed annually. During production samples are regularly taken and tested. We assess odour, colour, coarseness of flour, breaking-up of the kibble, its weight, moisture and composition. We use NIR to test whether our products chemically meet our specifications. Additionally, we have our products tested microbiologically and chemically by an external laboratory. Thus we can be sure that the products meet all requirements and that we can safely supply them. All process data and quality results are stored in our automated quality system. In addition, there are quality inspections to ensure that the production is carried out under optimal conditions. 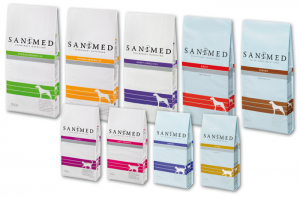 The range of Sanimed dietetic foods combines evidence – based knowledge on the efficacy of dietary therapy and long term experience in the production of pet food. The dietetic foods have been formulated in relation to the characteristics of the various diseases in order to provide optimal treatment or to prevent recurrence. Once the products are released by the quality department, they are packaged. At this stage we once more check whether the quality of the food meets our requirements. We print a code on the bags. This code enables us to trace the product at all times and determine the raw materials used to make it. The product is then stored in dry and clean warehouses. These warehouses are regularly checked for proper hygiene. The package text of dietetic pet food is subject to EU legislation, concerning aspects such as the approved clinical application and duration of use. The Sanimed dietetic foods are complete foods and thus adult animals can be fed on these diets for unrestricted periods of time. Leotsakos I.K.E. is Sanimed’s exclusive representative in greek & cyprus market since 2004.